Ok, it’s been awhile since I’ve checked in. My only excuse is that it’s winter – my favorite time to hunker down and go full throttle on a project. There’s no way I’m going to some place warm! And I know that some of you are of like mind, but we happy hibernators generally don’t get much agreement out there. I’m happy to say that I just finished a piece I’ve been working on since fall. Cover Up depicts cultural and national forms of head coverings and tribal markings that reflect notions of female modesty, fashion, status and conformity from different times and places. I’ll show lots of photos of Cover Up on this blog in the future. My Facebook and Instagram followers have been getting frequent glimpses throughout the process, so head over to one of those sites if you’re curious. For now, let’s play catch up with a series of posts about a 24″ x 30″ piece I finished last summer. Whiskers focuses on beards and mustaches, showing an array of male characters from different cultures and historic periods. Little men peek out and display themselves like an unlikely collection of international souvenir dolls. 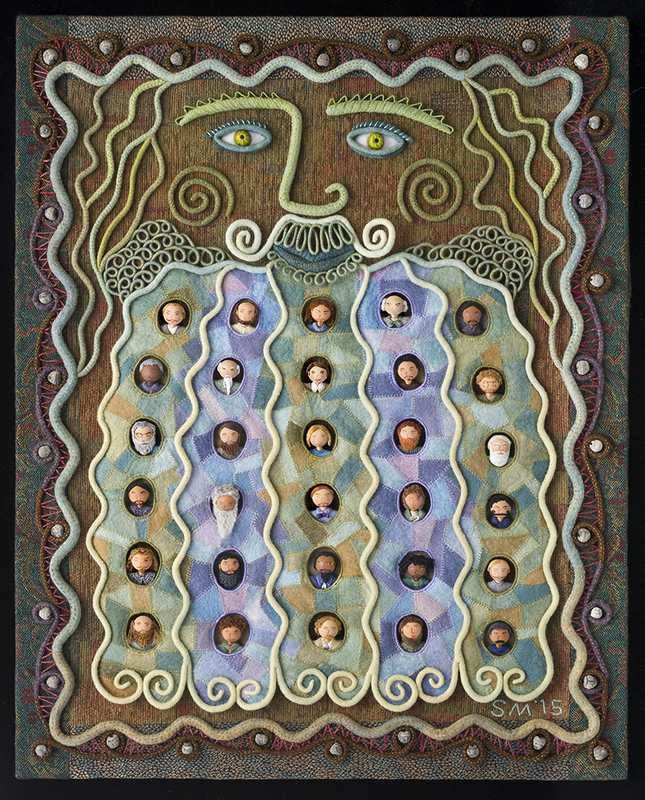 Their painted wooden heads appear in vertical lines, within a large man’s beard, which acts as a holding place. The bulk of the large beard is comprised of small pieces of felt that are patched together by hand with embroidery stitches. The large man’s bas relief face and beard are defined with lengths of wire covered with felt or wrapped with thread. Whiskers explores diverse societies and their origins, using needle and thread to signify the unraveling and mending of human cultures throughout history. 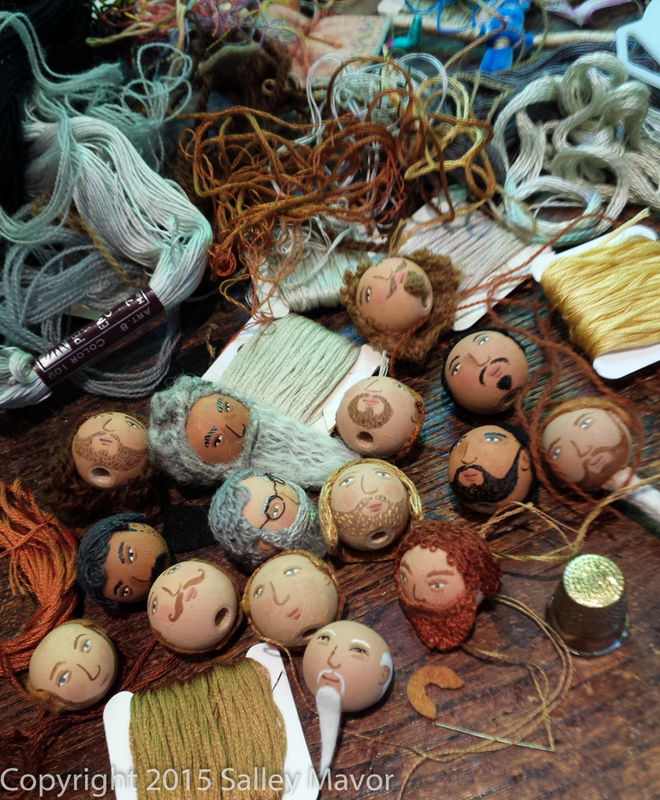 I made the heads like the wee folk dolls in my how-to book, Felt Wee Folk – New Adventures. Some beards are painted on the wooden bead head. 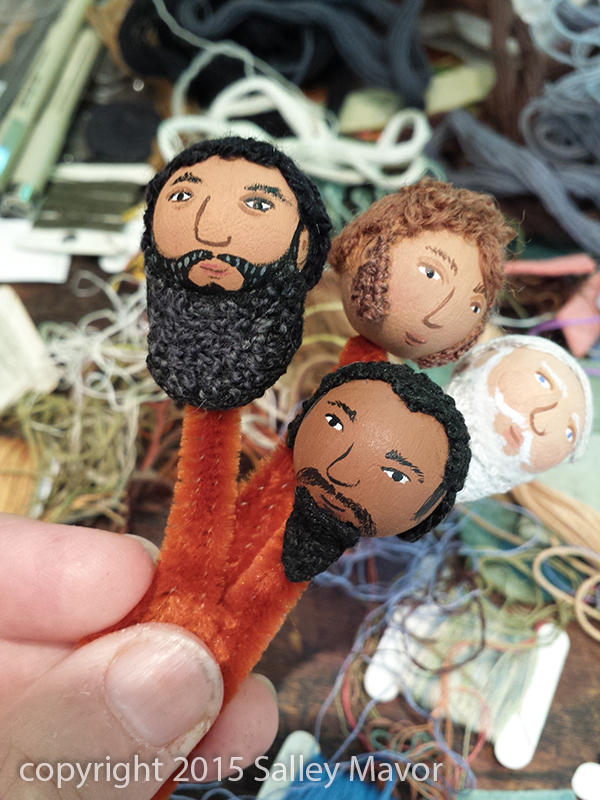 I also tried something new, by gluing embroidered felt beards to their faces. I had a blast researching beard styles for the collection of characters. This piece is a continuation of a new series that explores history and fashion. Face Time (shown left) is a previous piece showing cameo portraits from early civilizations to the present day. See Whiskers Part 2 here. This entry was posted in Dolls, Embroidery, Fabric Relief, Felt, Sculpture, Wee Folk, Whiskers by Salley Mavor. Bookmark the permalink. This is epic! An amazing piece! I love all of the little details and artwork. I also love that you share diversity. What an absolutely amazing work of art and history you have created. Thank you for sharing it with us! Fascinated by your new art work! I have just shared it with a friend of mine who is staying with me to do painting with an artist from Russia. We love your work, as my friend and I both also love to do embroidery! 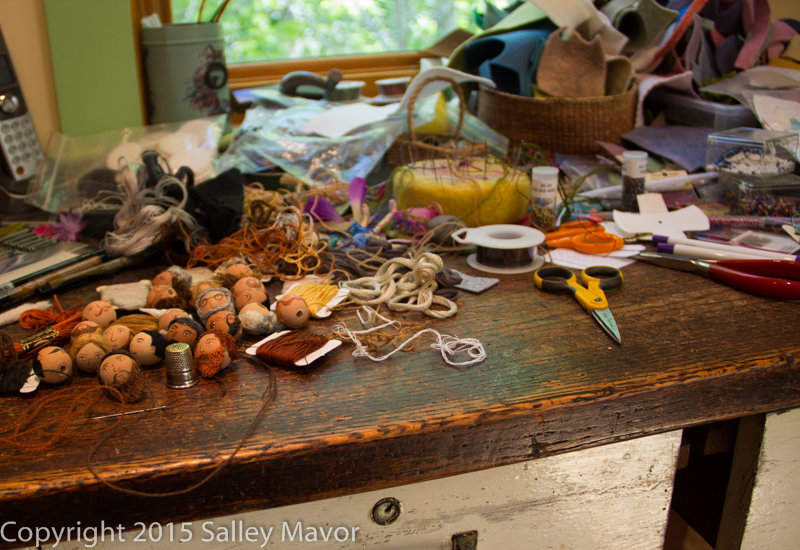 Winter months are my favorite, too, because they afford more working time with stitching and painting! This is an awesome piece of work!!! 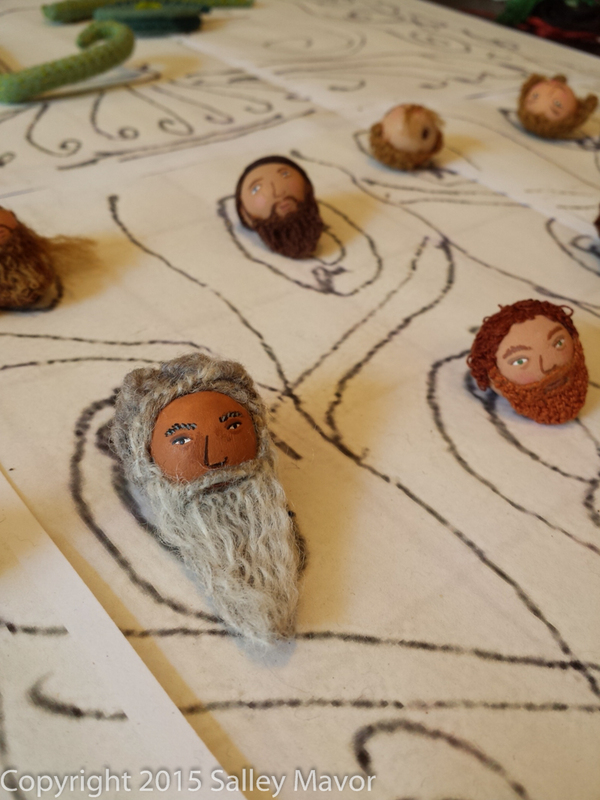 When I first saw it, I thought all the faces were of the dwarves in the Hobbit movies….I love that series. Great job, Salley!! Once again, I have gotten happily lost in all the detail work after seeing the piece as a whole. Whiskers 2 post was really amazing and you wear the whiskers well too! You exceed all expectations and I’m glad you do! Hi Patty, I’m glad that you’re enjoying Whiskers. The #2 post was published prematurely, before I even wrote the words, so stay tuned for another try soon! Couldn’t find where to post on the Whiskers 2 but had to say you are a riot! Loved you holding it up to yourself. You do great work and think it will be yet another wonderful work of art when you have it completed! Thanks for sharing. Hi Lilia, I’ve had to trash Whiskers post 2 because I inadvertently clicked the publish button before I had a chance to fill in the words. The completed version will be posted soon. Salley, this is just wonderful!